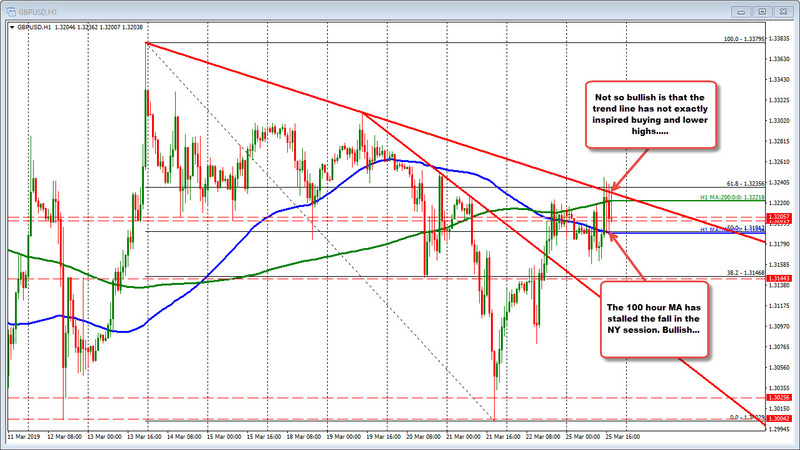 The GBPUSD has been up and down and up and down in the NY session. In the process, there is a common pattern. The 100 hour MA has stalled the falls. If you like the GBPUSD, that MA is a risk level. Stay above, is more bullish. Move below and the pattern is different. I would expect more downside. That is the bullish news. The not so bullish news is the price moved above a trend line on each hourly bar in the NY session, and each break failed. Moreover, the highs stalled a succesively lower levels. That is not so great. So the bulls are trying to keep control, but the sellers are also in play on rallies. Watch the 100 hour MA for support. If it can, all is well with the potential squeeze higher. Alternativly, if you like the downside story fundamentally or technically, don't go above the trend line or start making new highs. You want to see that 100 hour MA broken (and stay broken) as well.